We're partnering with the Mayor of London to establish the London Housing Panel, which will bring together voluntary and community organisations with a particular interest in housing in London. 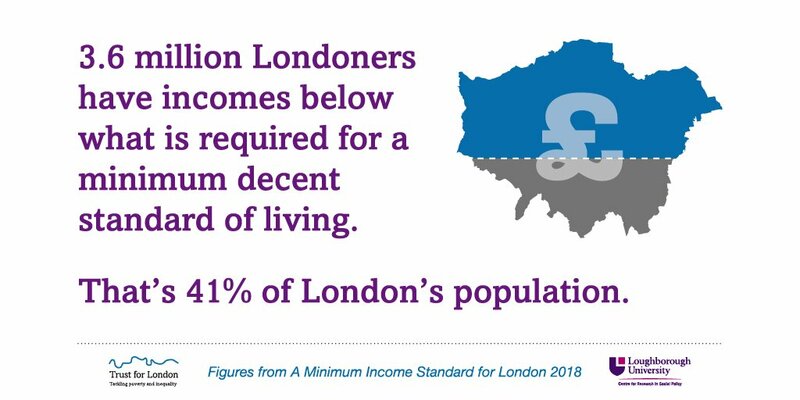 High housing costs are a major contributor to poverty in London, and supporting work that promotes Good Homes and Neighbourhoods is one of our seven strategic funding priorities for 2018-22. In 2018 we made 23 grants totalling £1,984,700 in this area. We also work alongside funded groups to understand their perspectives and amplify their voice in the policy-making process and in the media. This includes responding to policy consultations, and participating in the Examination in Public on the draft New London Plan. In 2018 we began convening the London Housing Campaigners Group, in partnership with The Social Change Agency. The Mayor of London wants to make sure his housing policies are developed with the involvement of London's diverse communities. The Panel builds on the Mayor's existing work to involve and engage Londoners in decisions about their city. The Panel's primary focus will be to engage with housing issues facing London. Examples of discussions might include reforming the private rented sector, exploring resident involvement in estate regeneration, or understanding students' experience of housing in the capital. The Panel will provide the voluntary and community sector with a structured way of engaging with the Greater London Authority (GLA) in relation to housing policy, and vice versa. Trust for London staff will be responsible for running the Panel, including leading the recruitment process for the Panel Chair and Panel Members. The Deputy Mayor for Housing and Residential Development, James Murray, will attend meetings of the Panel, if invited to do so. Both the GLA and Trust for London are providing funding and in-kind support to help make the panel work. Who will be on the Panel? We are currently recruiting for up to 15 Panel Members and an independent, individual Panel Chair. Panel Members will be London-based organisations, providing services, representation or carrying out advocacy work in relation to housing in London. Details of the perspectives we wish to see included in the Panel Membership are set out in the Application Pack. Given the diversity of our city, and that housing issues can particularly affect certain groups, it is our ambition that the Membership of the Panel will reflect the profile of London and be inclusive of and accessible to different groups of Londoners. Panel Members will be organisations rather than individuals. Organisations are asked to name a lead individual to be their primary representative on the Panel and main contact. Organisations appointed to the Panel will be expected to coordinate with, consult and provide feedback to other groups within their networks and sector. Members are also encouraged to bring the voices and experiences of those directly affected by the issues into the discussion. A detailed application pack, with information about the recruitment process and criteria for the Chair and Panel Membership can be found below. We encourage people to read the application pack in full. An easy read application pack and application forms are provided. The deadline for all applications is Tuesday 7 May at 10am. There will be an Information Event about the London Housing Panel on Tuesday 23 April from 2-4pm at Trust for London's offices. To attend, please sign up at Eventbrite or email housing@trustforlondon.org.uk with the name and organisation of the person attending, as well as details of any access or dietary requirements. BSL Interpretation will be provided upon request.